nearly 20,000 years ago, average temperatures around the world were about 6 c lower than today. At that time, the atmosphere was dry and dusty. The climate was unstable, and prone to sudden swings between mild and freezing spells. Sea levels were lower and ocean currents ran more slowly, according to scientists ( New Scientist , Vol 157, No 2121). Thousands of years before that, things were almost similar to what is being observed today. And 20,000 years prior to that, giant sheets of ice stretched on the Earth. The change of atmospheres from cold to warm and back to cold has been going on for the last million years. Even after these findings, researchers are not sure how such phenomenon takes place. If the dramatic shifts could be studied properly in the natural climate system, one might know more about how the Earth may respond to climate-changing efforts, say scientists. Till recently, researchers thought that combined effects of changing sunlight patterns and the changing sea currents in the North Atlantic might have been the reasons behind the phenomenon. In 1996, two scientists from California suggested that these climate changes could all be down to dust pouring onto the Earth from space. This idea has not made any impact on the research process. However, it has posed challenges to the traditional model and inspired several research activities. The continuous efforts in this regard is gaining ground, and it seems that very soon, researchers may come out with a new explanation. In 1920s, Milutin Milankovitch, an astronomer from Yugoslavia came out with a conventional explanation of the ice age. He suggested that small unsteady moves in the Earth's orbit might be the reason. The astronomer noticed that the Earth's orbit around the Sun is distorted by the gravitational pull of the Moon and other planets. This leads to three changes about the way the Earth orbits: the shape of the orbit - more oval or more round - how much the Earth's spin axis tilts away from vertical, and the time of year when the Earth is closest to the Sun. The distortions do not make much difference to the amount of sunlight reaching the Earth. However, they have a big effect on the amount of sunlight arriving at different parts of the globe, and at different times of year. The outcome is that regular cycles in the sunlight pattern have periods of 100,000 years in the ovalness, 41,000 years in the tilt, and 23,000 years in the timing of closeness to the Sun. Molankovitch thought that the Earth's climate is controlled by these changes in the pattern of sunlight. Scientists who are investigating how climate changed in the past, have already found signals with all the three frequencies. 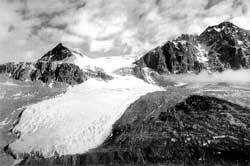 But for the 23,000- and 41,000-year cycle - the timescale on which ice ages occur - Milankovitch's theory faces problem. The climate changes going into and out of ice ages are ten times the size of the ones on the other two cycles. Changes because of the ovelness have the right timescale to explain the ice ages, but they are far too small. But Milankovitch suggested that something else might be responsible for changes in sunlight patterns. According to him, large ice sheets may be the components that form on the continents of the northern hemisphere during the ice ages. Whenever relatively little sunlight falls on these areas during the summer, ice sheets do not get a chance to melt. In such circumstances, growing ice sheet cools the surrounding region. It happens by direct cooling of the air that blows over it and by reflecting more of the Sun's warmth back into space. This implies that a small initial change in temperature might trigger growth of the ice sheets, that may in turn, lead to more cooling. Even after such postulations, it was not clear how changes in this region may affect the rest of the planet. In the 1980s, Arnold Gordon and his colleague Wally Broecker at the Lamont-Doherty Earth Observatory of Columbia University, New York, usa , found that the North Atlantic comes with its own system for transmitting local climate changes around the world. It is the starting point for the deep-ocean currents that drive a global "conveyor belt" of ocean water, carrying heat along with it. Water sinks in the North Atlantic, flows southward, around Antarctica, and then northward into the Pacific before returning to the surface. Changes in the local climate in the North Atlantic could easily alter the rate at which the water sinks and hence change the whole circulation system. After such findings, most researchers have reached a consensus. They were of the opinion that variations in sunlight patterns in the northern hemisphere changes ice sheets around the North Atlantic that influences the ocean conveyor belt. And it cools the planet by changing the way heat is transported around the Earth.